I remember when I was a little girl, my dad made yogurt with a little yogurt set. It consisted of a warming plate and 4 little containers that sat on it. Sometimes the yogurt set, sometimes it didn’t. I’ve read yogurt recipes that have you mixing the milk and a culture in jars, then storing in coolers, or in the oven, even out in the sun and if the all was right with the world yogurt would be born. Since it always seemed like such a hit or miss endeavor I never tried it…until I started seeing recipes about making it in a crockpot. Searching online, I read as much as I could from different sources and believe me it is YUMALICIOUS, and is so easy to make! Turn your crockpot on low. Go ahead and measure out the yogurt that you’ll be using for the starter. It can be warming up to room temp while you are heating up the milk. Pour milk into a heavy bottom saucepan set on burner to medium heat. Using a candy thermometer, heat milk to 180 F. stirring constantly so the milk doesn’t burn. Adjust the burner as needed. When the milk hits 180F. hold it there for about 10 minutes then remove from burner and let cool to 110F. 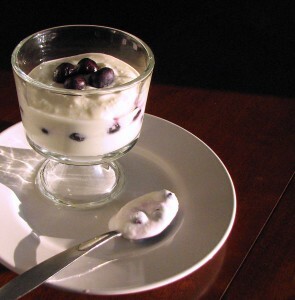 Pour into a crockpot, add the 1/2 cup of yogurt (this is the starter) and blend thoroughly with a spoon or whisk. Turn crockpot off and wrap with a couple of large towels. Leave undisturbed for 8 hours or longer. I usually start mine around noon, then the next morning I set it up to drain to make greek yogurt. Check the yogurt; it should be solid with a yellowish liquid (whey) when you stir it around. If it does not seem fairly solid leave it for a few more hours. To thicken it up, completely line a colander with coffee filters and pour the yogurt in to strain. This may have to be done in batches depending upon the size of the colander. Let strain for an hour or to your thickness preference. I like mine really thick so I usually set the colander in the sink, pour in the yogurt and after straining for an hour or so I set the colander into a larger bowl. The whole thing goes into the frig to strain for a few more hours or overnight. Store the finished yogurt in a container and refrigerate. Instead of adding sweetener or fruit to the entire batch flavor each individual serving. That way you can mix up different flavors each day. Since I commute to work and we always have lots of fruit in the freezer from our garden, I place frozen fruit in the bottom of a container, then add a cup or so of yogurt, then drizzle honey over top or add a spoonful of of my homemade vanilla extract. By the time I get to work the fruit is thawed. At this point you can add granola, flaxseed or other toppings. This yogurt is also great in smoothies.